I am very fortunate to have National Park close by which stretches from the north, to the east and around to the south. 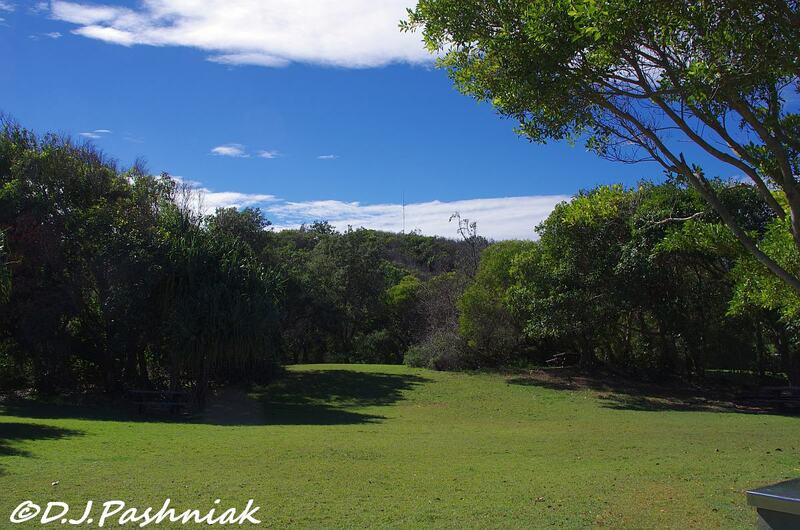 While there are many walking tracks which cross the park, many places are too distant and need a 4 wheel drive to reach. I drive an ordinary car! Last week two good friends offered to take me down the Freshwater road across the park and over to the beach on the eastern side. (Many thanks to Sarah and Graham!) Driving safely on the beach requires a low tide so we planned for a day when the low tide was in the middle of the day to give us plenty of time to get over there and have a good look around. This link is to a map of the area. 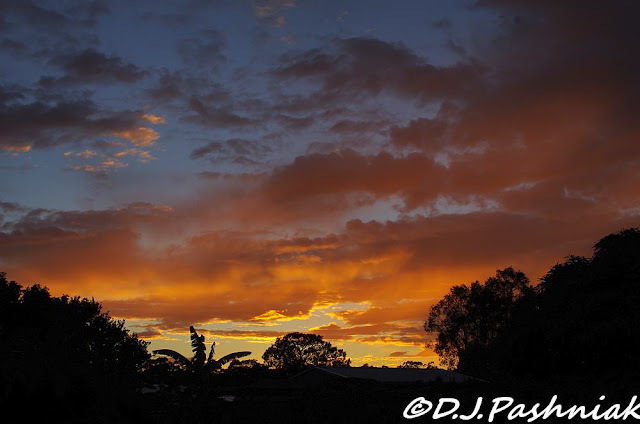 After careful planning we woke up to a sky like this - and then the rain showers began! The radar showed that the showers should pass out to sea and by nine o' clock it was fine and sunny. The Freshwater Road through the park goes off the Rainbow Beach road. 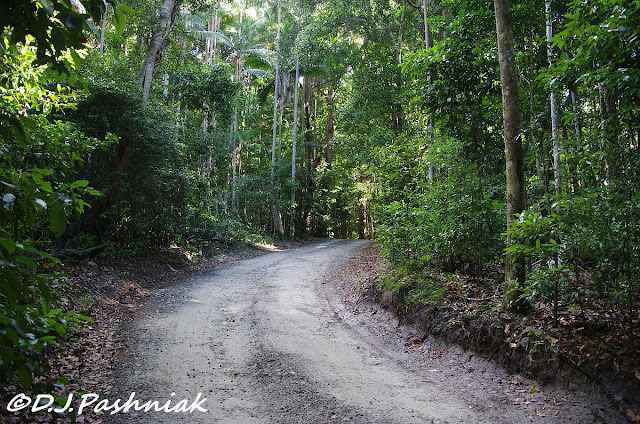 Rainforest starts a few kilometers down the road. The road is accessible to ordinary vehicles as far as the Bymien Picnic area. Beyond this, it was all new country to me. The road was narrow but for most of the way it had a good base of gravel over the sand. 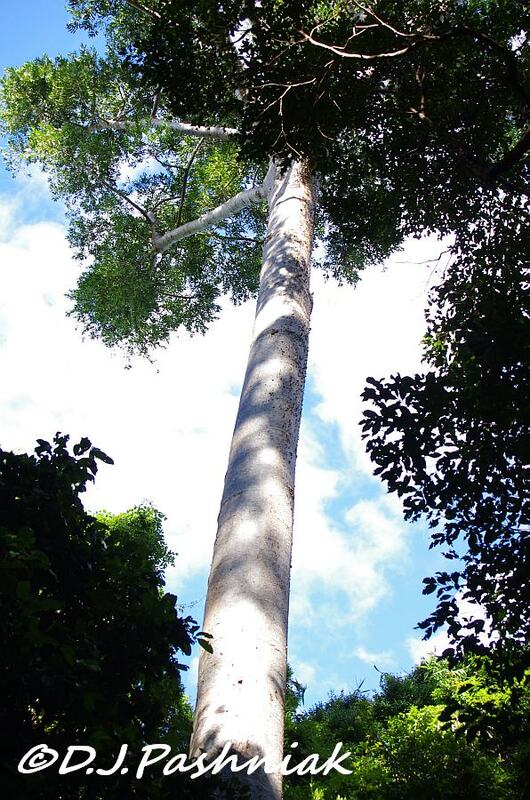 The rainforest is amazing! Beyond this, the forest becomes first wet and then dry sclerophyll forest. 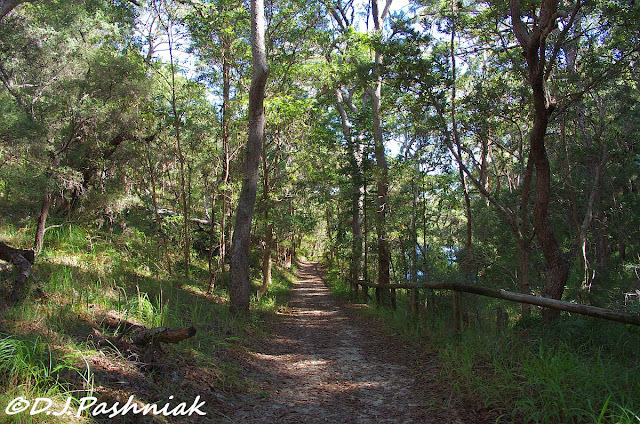 There are lots of small walking tracks going off from the road but we didn't stop to walk until we reached the Freshwater lake. At present this lake has plenty of water in it but a few years ago during the drought it was completely dry. Just beyond this is the Freshwater picnic and camping area. It is well maintained and looks so different from what you have just traveled through. This is a pandanus palm which is a native species and common around much of the coastal area. 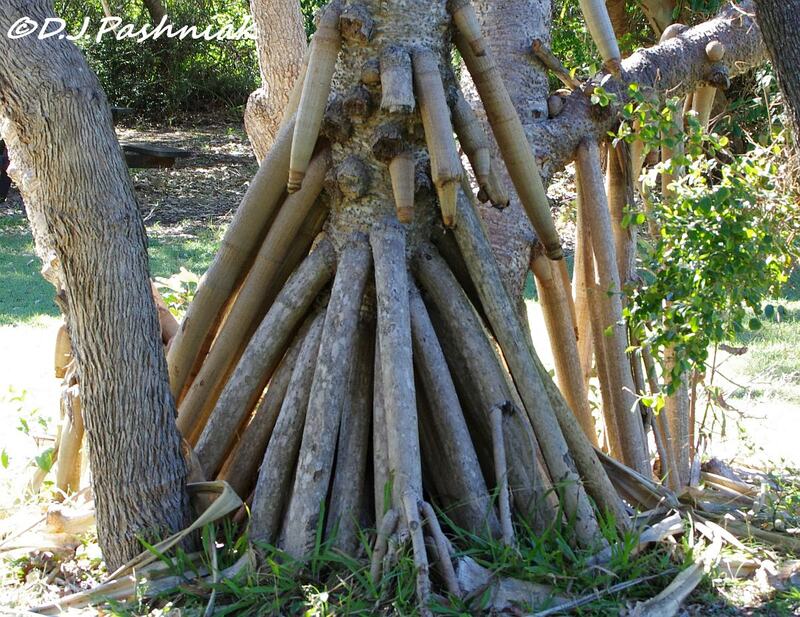 The palm puts these roots out from its main trunk and they slowly grow down into the ground. I heard birds everywhere! But if I had stopped to photograph them there wouldn't have been time to see all the things that I wanted to! So I hurriedly snapped only the birds that came around us at this picnic area. The Brush Turkeys seem to be everywhere and this one came around as soon as we stopped for afternoon tea. 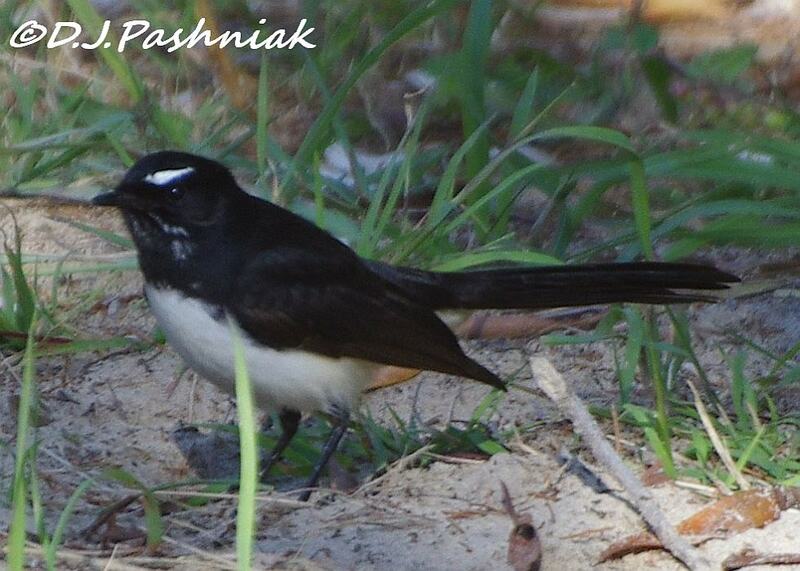 Willie Wagtails - likewise - seem to be everywhere! 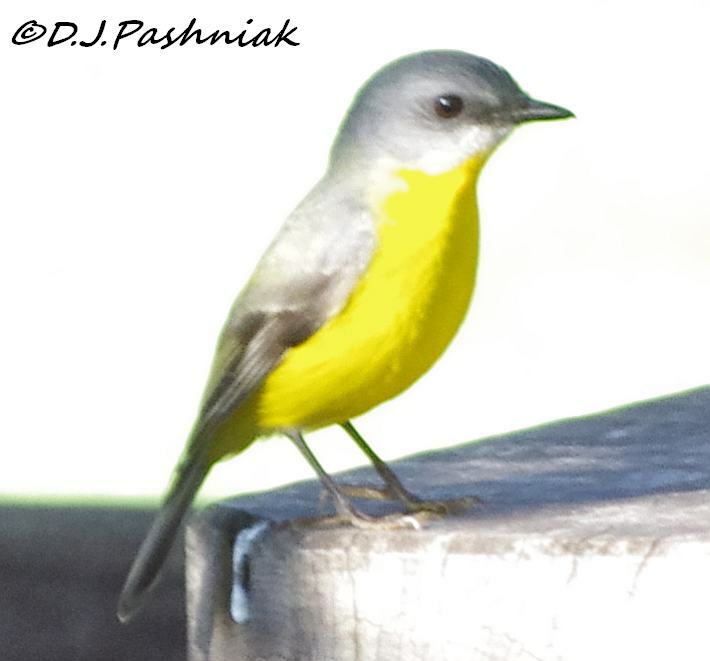 This is an Eastern Yellow Robin and is also fairly common but I have not yet got good photographs of it. 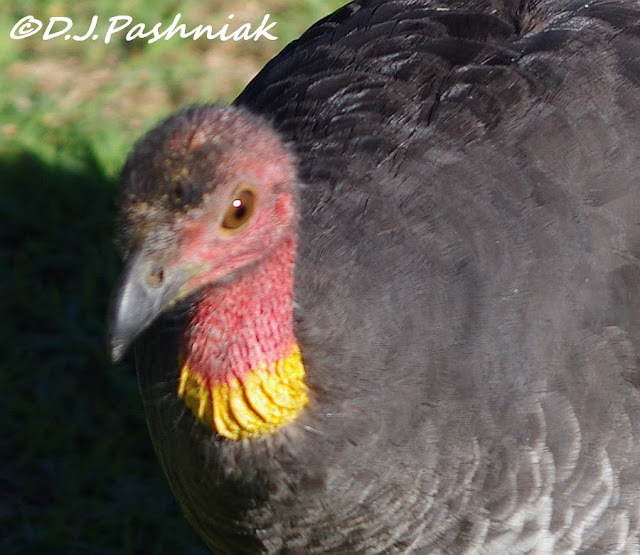 This one was perched for a few seconds under a picnic table and in the shade but with bright sunshine beyond it. It is only a few meters beyond this area to the beach. 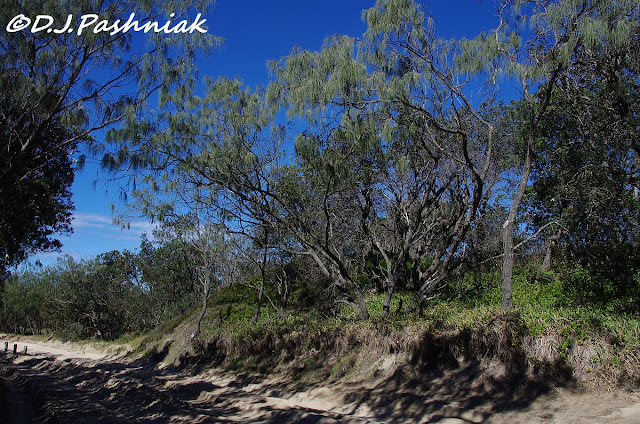 Suddenly the vegetation changes again to the lower scrubby growth which is all along the beach. 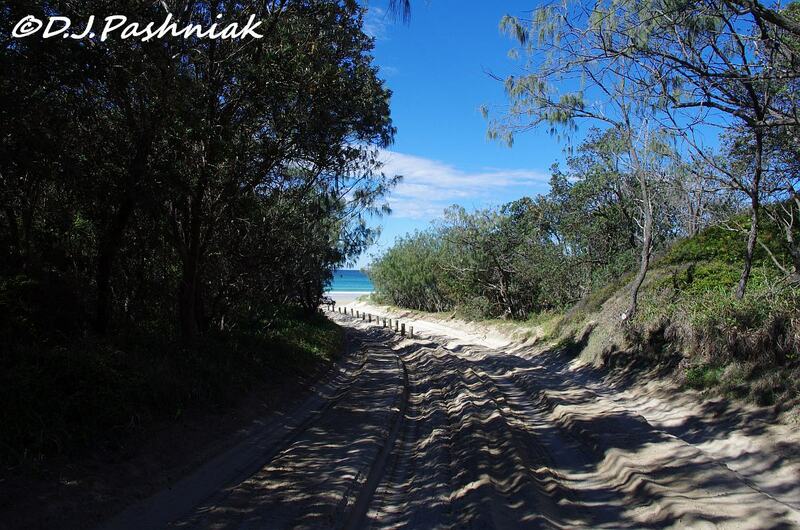 The road changes also to dry and deep sand. The next part of the trip was along the beach - and that will come next week! how great of your friends to take you in further than you've been before. lush forest, too! 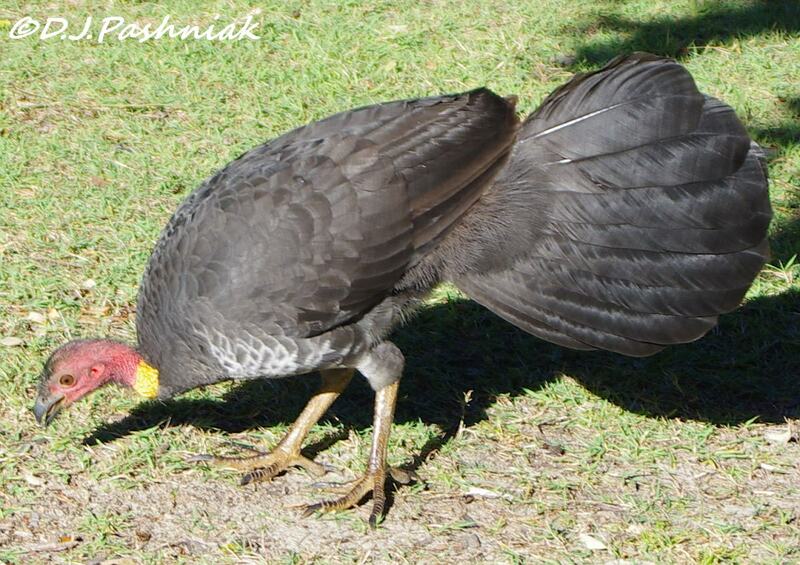 carole m. posted a brush turkey today, too! so cool. Thar sky shot is fantastic!! Boom & Gary of the Vermilon River, Canada. Mick, the sky shot is beautiful. A lovely sunrise. The rainforest looks like a wonderful place to visit. I am sure there are birds galore there. Love the turkey and the cute robin. Great post! Great nature und beautiful photos. How lucky to have this beautiful place so near you. I loved all your photos and was very interested in that yellow robin. Great photos! oh how nice to get out with friends to this lovely place. I enjoyed your photos very much and aren't those yellow robins a treat? Obviously a person could spend many many hours in this beautiful place and not see all of it. Such a beautiful place! Love your shots. 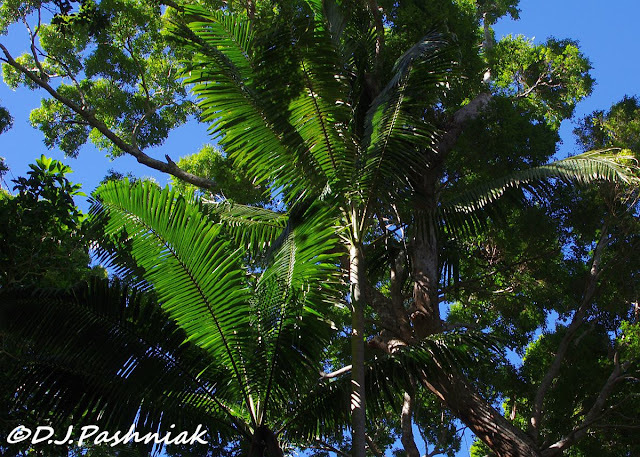 Love rainforest, love the beach . Great to have someone take you there with a vehicle that can go along the beach. Nice bush turkey and willie wagtail Mick. Rain forest and then the beach. What could be better? Great shots of a couple of the local birds. You'll definitely have to return so you can report on all the other birdlife there! Looking forward to your beach adventure. Looks like a great day!! I'd love to own a 4WD so I could make trips like that. I have so much to explore on the Sunshine Coast... and beyond! The area is so rich with diversity! Love your shots. What an unusual turkey. I love the glimpse into your world and the birds also. interesting adventure. Lots of things to see. What a fantastic sunrise, and some unusual birds, love the scenery. Fabulous sunrise! I love the Aussie bush, great shots. 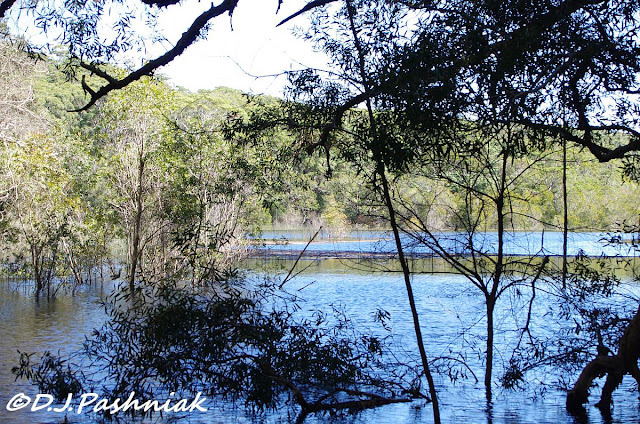 Beautiful and scenic sceens from the national park with nice birds. 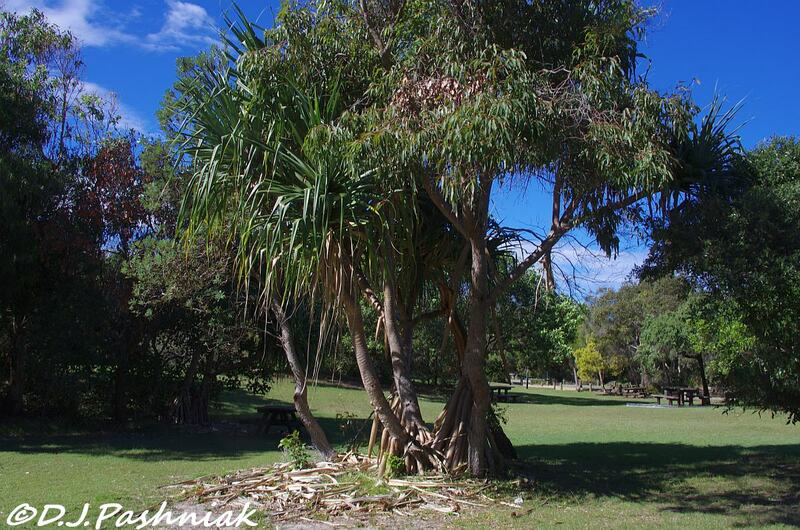 The pandanus palm is an amazing tree! Enjoyed the trip. Willie Wagtail. What a great name. Firstly, please thank Sarah and Graham for all of us with whom you've shared this lovely place! The tree trunk of the palm is quite a structure to see. So glad you included it. Looking forward to part two next week. It is nice to have friends with off-road vehicles. I think I may need to buy one the next time I'm shopping for a car. That is an interesting turkey. Ours look much different. Interesting ride! The softness of that Yellow Robin photo add to its attraction! Well, thats not Victoria! Nice pictures. My son had the living daylights scared out of him when a turkey jumped out onto to a path! I laughed - rather too much!